The Syrian government and its ally Russia have escalated a bombing campaign in Eastern Ghouta, an area in the Damascus Countryside home to 400,000 civilians. The attacks have left scores dead and hundreds injured this past month. This comes after six years of a cruel siege where Syrians have been trapped in a daily barrage of attacks to deliberately kill and maim them. The relentless bombing of Eastern Ghouta constitutes a flagrant war crime. On 24 February, the United Nations Security Council (UNSC) voted on a much-delayed resolution calling for humanitarian aid into Eastern Ghouta and a partial ceasefire. While this is a welcome development, starving civilians awaiting life-saving assistance and protection from deliberate bombardment should not have to wait on a UNSC resolution or ceasefire. On 25 February, reports emerged of a chemical attack in Eastern Ghouta. In February 2017, the Syrian government captured the areas of al-Qaboun and Barze, which border the Harasta neighbourhood of Eastern Ghouta, and closed all smuggling tunnels that had for years guaranteed a minimum flow of food, water, and medical supplies. On 3 October, the Syrian government further tightened the siege by closing the last remaining entry point to Douma, the al-Wafideen checkpoint, impeding access to medical and humanitarian aid and barring civilian movement. Only three aid convoys have been allowed in since, but both were significantly understocked to address the humanitarian needs of the population, and all medical supplies were removed by the government. Since October, the humanitarian situation in Eastern Ghouta has significantly deteriorated with prices of medicine and basic food supplies, like milk and bread, skyrocketing. 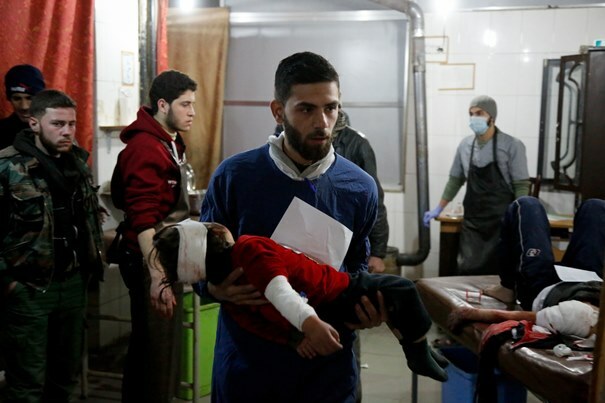 According to medical personnel in Eastern Ghouta, 14 people have died while awaiting medical evacuation. The medical evacuation of 572 people with severe injuries and chronic diseases has been pending approval from the Syrian government since July 2017. On 27 December 2017, the Syrian government approved the medical evacuation of 29 critical cases from Eastern Ghouta. This evacuation was completed on Friday 29 December 2017 with 17 children, six women, and six men transferred to hospitals in Damascus, where they are being treated for serious injuries or medical conditions such as heart disease, cancer, and kidney failure. Medical personnel corroborated news about the evacuation being agreed after negotiations that led to the release of individuals held by the armed opposition. These 29 cases were at the top of the list of patients awaiting medical evacuations due to the urgency of the cases. 529 more patients still require urgent medical treatment for their injuries and diseases. Doctors and medical workers are unable to provide adequate medical care to the injured and ill due to lack of adequate surgical supplies, medical equipment and medicine, particularly for treatment of chronic diseases such as cancer, heart disease, and diabetes. As a result, doctors are using expired medicine from destroyed hospitals. There has additionally been a rise in cases of acute malnutrition, especially in children, exacerbated by the lack of access to food, humanitarian aid, and other life-saving necessities.